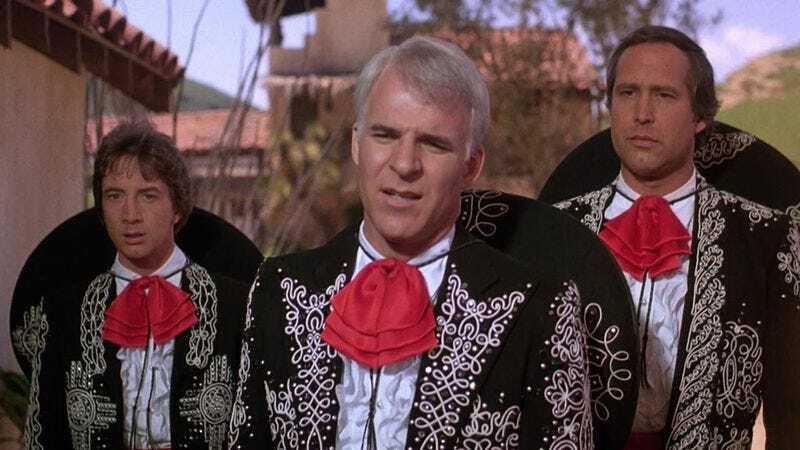 Actorly pretensions and dim-witted cluelessness are affectionately ridiculed in Three Amigos!, a Lorne Michaels-produced, John Landis-helmed comedy about three silent film stars who, through a combination of miscommunication and idiocy, find themselves in south-of-the-border trouble. After greed and arrogance costs them their jobs at a Hollywood movie studio in 1914, the leads in the “Three Amigos” film series—Lucky Day (Steve Martin), Dusty Bottoms (Chevy Chase), and Ned Nederlander (Martin Short)—think their fortunes have turned when they receive a telegram informing them that they’re wanted in Mexico to put on a show for the “infamous” El Guapo (Alfonso Arau). Too dense to know what “infamous” means, they make the journey, excited to earn money as performers, even as the townsfolk who sent the missive—including beautiful Carmen (Patrice Martinez)—believing that the movies in which Lucky, Dusty, and Ned star are real, expect the trio to perform as actual heroes. This comedy-of-confusion setup is executed with pitch-perfect lunacy by Landis and his headliners, whose rapport is built upon the fact that each of their characters is equally idiotic; when Carmen states that she has eyes for the dumb one, another woman asks, “Which one is that?” Three Amigos! remains most notable for the trio’s signature hip-thrusting proclamation of their name, though the film’s spoof of silent-actor affectations as well as celebrity haughtiness and entitlement provides many of its finest laughs. (The hilarious centerpiece scene has The Amigos, finally face to face with El Guapo, discover that they’re not in a staged production but, in fact, in the middle of a real Mexican stand-off.) Playing off classic Western tropes and scenarios with a gleefulness that often tips into absurdity—especially with gags involving a bonkers rendition of “My Little Buttercup,” a meeting with a singing bush, and El Guapo’s speech about “a plethora of piñatas”—it’s a comedy that expertly balances movie-industry satire and out-and-out silliness. Availability: Three Amigos! is available on Blu-ray and DVD, which can be obtained from Netflix or your local video store/library, or to rent or purchase from the major digital services.